The Clashindarroch Forest near Huntly in Aberdeenshire is one of the best sites in the UK for holding snow. 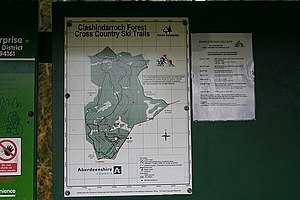 With this in mind in early May 1999 discussions were initiated with the Forestry Commission (the owners of the Clashindarroch) and Aberdeenshire Council concerning the establishment of a National Sled Dog Sports Centre to be based at the Council’s existing Huntly Nordic & Outdoor Centre (HNOC) with dedicated snow trails in the Clashindarroch Forest. In subsequent meetings with the Forestry Commission, the Council and the Nordic Ski Club (the primary users of the HNOC) an agreement was reached for joint use of the Centre and the dedicated snow trails in the Clashindarroch Forest. The National Sled Dog Sports Centre was created with the purpose of providing dedicated snow venues for training and coaching courses for sled dog owners and for competitions. The HNOC, which is managed by very dedicated members of the Nordic Ski Club, is located in Huntly on the river near the castle. The facilities have been used in the past for sled dog seminars and meetings and can be booked for similar events. Information on snow conditions and maps are posted on the HNOC web site. Members intending to use the Clashindarroch snow trails should contact the HNOC to make sure that no skiing events are being held at the time. In the early years there was considerable snow at the Clashindarroch and training and race events were held. The level of national interest was not as high as one would have anticipated, most people preferring to concentrate on dry land training and racing. In recent years, interest in sled training and racing has grown, but snow conditions have worsened. With this in mind, two years ago a number of Centre Members decided to concentrate on dry land distance training and racing. This led to the creation of several races in the Huntly area. This coming season we will be holding four distance events in Scotland. If snow conditions make it possible, distance sled races will be added to the programme. While these events are being held mainly for Centre Members, they are open to non-Members. There are currently over a hundred Centre Members. Participants in Centre events must have civil liability insurance in the amount of 5 million pounds, as this is required by Forestry Commission Scotland. This level of insurance is provided for all Active Members of the Centre. Active Members are those Members who have paid their membership dues, which are payable in March of each year. Active Members receive a personal insurance certificate assuring them of complete coverage for all sled dog related activities including racing. Those Members of the Centre who have not paid their annual dues are not considered Active Members and are not listed as such with our insurers. Non- Active Members and non-Members are allowed to participate in Centre events, but they must provide evidence of equivalent coverage, mainly an insurance certificate which names them as an insured party and details the amount and nature of the coverage provided. John Carter, Bowland Trails, Netheraird of Glasclune, Blairgowrie, Perthshire, PH10 6SF. You should provide your name, address, email address and a passport style photograph along with details of your experience running sled dogs, including the number of years you have been active in the sport. There is an initial fee of five pounds to cover the costs of processing your first year’s membership and issuing a membership card. The insurance covers a year from 1 March to 28/29 February. INSURANCE POLICY COVER: The policy provides cover for legal liability under the Civil Law to the general public and Members of the National Sled Dog Sports Centre for personal injury or damage to property. This includes liability arising out of advice, (e.g. tuition and coaching) libel and slander and Member to Member cover. The policy also provides legal liability for associated claimant legal costs. in respect of claims for accidental injury caused by acts of abuse.